This 14-page pamphlet is perfect for people who are questioning their faith or are skeptical about Christianity have many common objections to Christianity that may not be answered by traditional arguments, such as: Does it even matter what I believe? Aren't all religions basically the same? Isn't it arrogant for Christians to claim they have the truth? How can anyone say what's right and wrong? How can Christians keep believing in God when evolution is a proven fact? How can Christianity be good for people when it has caused so much injustice? If God exists, why is there so much wrong with this world? Why does God allow bad things to happen to me? If God loves everyone, how can he send people to hell? Why be a Christian when there are so many hypocrites in churches? Here are quick answers to help people sort out life and faith. Useful as a discussion starter and evangelism tool. Quick, easy-to-understand,14 panels, fits inside most Bibles, 8.5 x 5.5 inches, unfolds to 38 inches long. 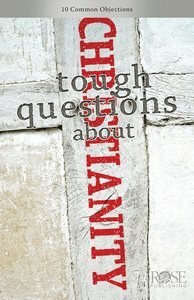 About "Tough Questions About Christianity (Rose Guide Series)"